Conversation hearts are everywhere around Valentine’s Day. I can’t stand the taste of them, but my hubby and kids love them. 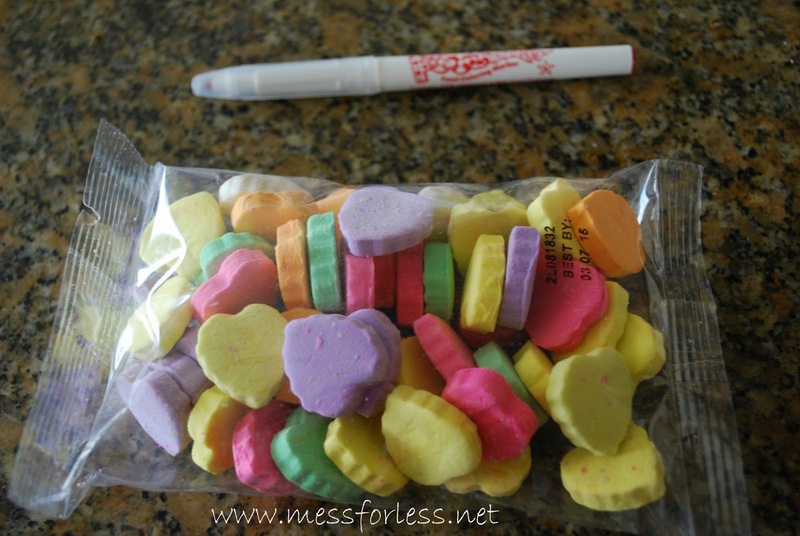 Recently, I saw these large conversation hearts at Walmart that came with a food safe pen so you could personalize the hearts with your own messages. 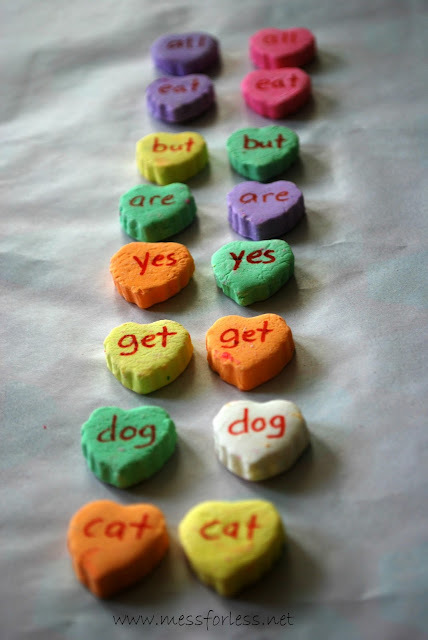 Immediately, I thought of how I could use these to help my girls learn to read and recognize words and letters. I created two matching games that the kids loved playing…and eating. 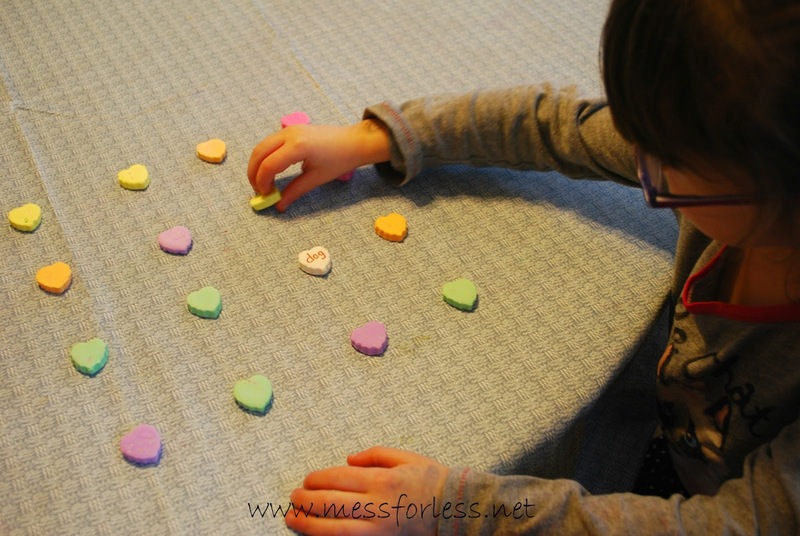 Read more to see how we made a Conversation Hearts Word Matching Game. 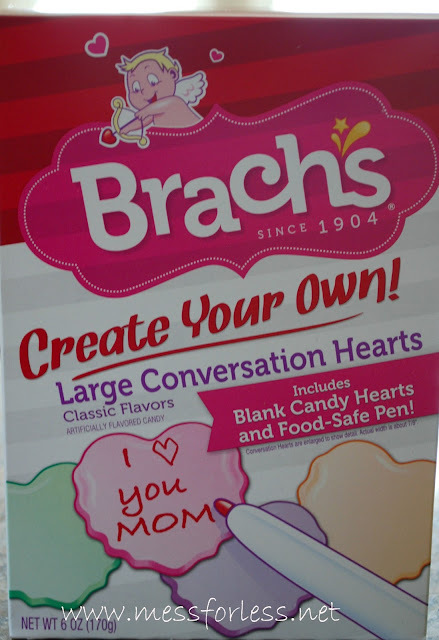 Larger conversation heart candy without writing on them (I get nothing for mentioning Brach’s Conversation Hearts, just something I saw at the store that I thought was cool) You can also use large hearts with writing and just write your words on the other side. Lay out your conversation hearts candy and write some simple words on them with your food safe marker. You will want to have 2 hearts for each word. The number of hearts you use for your game will depend on the age of your child. You will want to use more pieces if your child is older to make the game more challenging. My three year old is not reading yet, but she has been learning her letters, so I made a matching game with letters for her. You can really tailor this game to a number of ages and skill levels. The rules are the same as a typical matching or memory game. 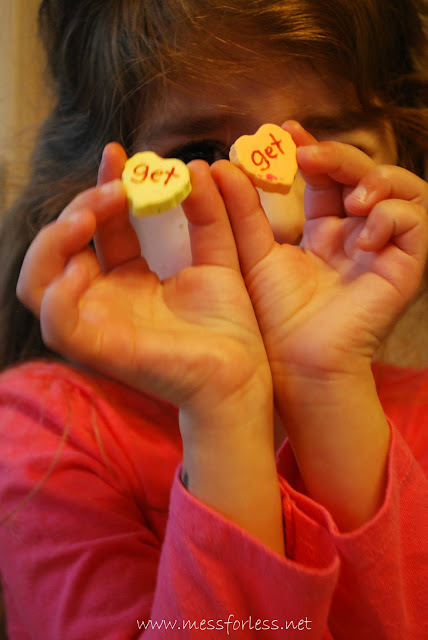 Children take turns turning over two hearts at a time until they find a match. They then get to keep those hearts. 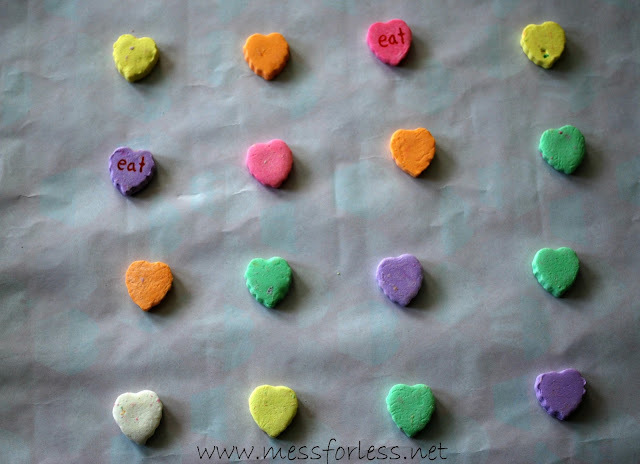 I didn’t want my kids eating a bunch of these candy hearts at once, so I told them before we started playing that they could choose one pair to eat. I thought they would put up a fuss about how they wanted to eat all the hearts, but they were happy with the two. I think it helped that I set up expectations before we started playing. We had lots of hearts left over and I am not a fan of the taste, but don’t worry, my husband was nice enough to take one for the team and have a bunch. What a guy! How fun! Can I play??! That is awesome! I need to go to Walmart now and find those conversation hearts. Great idea. Thanks for sharing! This is fun! I have my students use the silly phrases to write a poem! They are hysterical. I will ONLY eat the yellow (banana) ones. I've never seen the ones that you can write on! How fun!! I've never seen those. FUN idea!! I love this! I have not seen these candies! I need to look for them! Great idea! I didn't even know there was such a thing as blank conversation hearts! These are so cute. 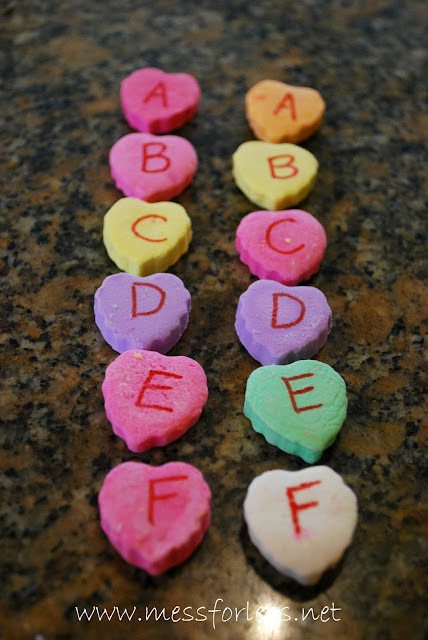 I'll have to keep my eyes open for these kind of conversation hearts. Oooh and the best bit is you get to eat them when you win!! 🙂 funny how your conversation hearts look so different from ours! I wish we had this in the UK! These are fantastic! What a find! Pinning! Thanks for sharing at After School!